In recent years, during its political transition, Nepal has made tangible progress in highlighting the rights of youth and increasing its focus on youth within its policy context. In 2010, the Ministry of Youth and Sports established the country’s first National Youth Policy to address the rights and needs of youth exclusively. This policy created a national definition of youth. Though the definition still remains somewhat controversial, its creation and existence indicate that Nepal is affirming youth’s societal significance. With the country’s nascent youth policy implementation still in process, now is a strategic time to assess the current state of Nepalese youth and youth policy and provide recommendations on actions moving forward. Up until now, little research has existed on this topic, with most existing analysis using census statistics from 11 years ago. Major changes have of course occurred in Nepal during the last 11 years, rendering much of the available data irrelevant to the current situation. In order to address this information gap, the New York-based Open Society Foundation’s Youth Initiative funded a youth policy review process to assess and examine the current state of youth and youth policy in Nepal, and to identify opportunities, gaps, challenges, and recommendations for moving forward. This review endeavored to look at the newly formed National Youth Policy, other sectoral policies addressing youth issues but not focusing exclusively on youth, specific issues that youth are currently facing within society, and perceptions of youth within Nepalese communities and by stakeholders. The aim of this review was to examine the process and background of youth policies in Nepal, how these policies affect young people’s standing within the country, the current state of implementation and coordination of these policies, and the various perceptions of youth and youth policy within the country. The review was also to be used to provide analysis and recommendations. Initial desk review of background documentation and empirical research. Because sufficient data and statistics on youth policy did not exist, this desk review was conducted in conjunction with first-round interviews with stakeholders. Country report draft. A preliminary report was drafted based on data collected from the initial desk review. Evident gaps and hypotheses arising from this initial country report draft served to inform the question guidelines for the country field visit. Country field visit. The country field visit took place in five regions of Nepal between September 11 and September 29, 2011. The team met with various stakeholders, including government officials, youth, and the staff of NGO and I/NGO local organisations. Finalisation of country report. Results and findings from this field visit were analyzed and have been compiled into this report throughout 2013. Youth participation and consultation were integral to this research process. The team used this review not only to research youth in communities, but also to empower and disseminate information to youth in communities. During focus group discussions, the team asked questions to challenge youth in finding creative ways to participate in the youth policy process, to voice their opinions in meaningful ways, and to learn how to devise their own solutions. For example, during discussions, youth identified the lack of information distribution and access to information outside of Kathmandu as a significant problem. Knowing this concern, the research team was able to guide youth participants in brainstorming the media sources to which all youth currently have access. Through these brief discussions, youth participants and interviewees came to recognize that since not all youth have access to more traditional media sources such as newspapers and television, these traditional sources may not be the ideal channels for distributing important information to youth. On the other hand, nearly all youth do have access to FM radio. Thus, youth themselves identified that FM radio could be a more effective communication channel for ensuring that important information would reach them within their communities. The team also utilised this consultative research process to ensure that youth and stakeholders were informed about youth policy and youth programs within their respective areas. Summaries of the National Youth Policy were brought to all meetings and focus-group discussions, and the research team members left behind these copies with all stakeholders and youth. Research team members also served as a bridge for information sharing. When team members learned about youth programs in the area through their meetings with stakeholders, they would make sure to share this knowledge with the youth in that region in order to increase awareness of the opportunities available to them. There is a strong need for information dissemination about the National Youth Policy and other youth-related policies in the districts outside of Kathmandu. 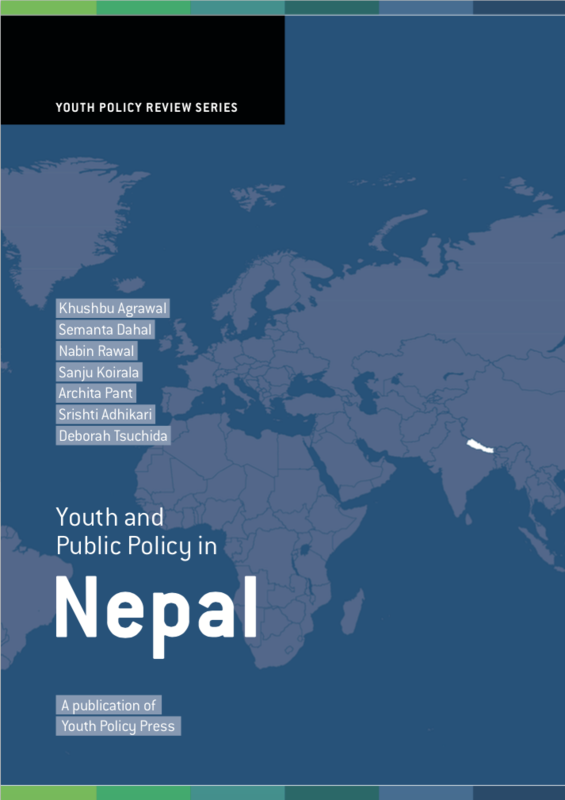 During the review, researchers discovered that while many youth, stakeholders, and line ministries were aware of youth policies in Kathmandu, outlying districts had very little knowledge or awareness of the National Youth Policy or other youth policies. Surprisingly, even many of the government district offices were unaware of the existence of a National Youth Policy. The National Youth Policy of 2010 is the first policy in Nepal not only to define youth and age limits for youth, but also to focus exclusively on the needs and rights of youth. As this document also extensively highlights the rights of Nepali youth, this policy has been viewed by many as a human rights charter for youth. While some stakeholders expressed doubt whether this policy will translate into action, many were in agreement that this particular policy still served as a step forward for youth rights within the country. There remains a need for youth to be recognised as a priority by all ministries, and for youth themselves to know that they need to be involved in decision making at all levels—from the local to the central. Currently, many Youth Focal Points from various ministries have not been properly oriented toward youth issues; thus, advocacy and trainings should be conducted with Youth Focal Points from these ministries to ensure they have the capacity to incorporate youth as a priority into their respective ministry programs. Greater coordination between line ministries, youth organizations, civil society organisations, and other stakeholders needs to be established. A current priority should be to establish effective communication channels between these various organisations, as information sharing has been particularly weak. Doing so will be a first step in establishing coordination, and ensuring less duplication of efforts. Currently, the official age of youth defined by the National Youth Policy in Nepal is from 16 to 40, an unusually wide age range that encompasses different stages of life. This report recommends that this definition be subdivided by age category when creating programs and projects to address the specific needs of youth. Furthermore, since youth often face varying types of circumstances, they should not be addressed only as a homogenous group when stakeholders are thinking about creating programs for them. Programs should thus be created to address the various needs of different groups of youth, depending on their education, skills, knowledge, and interests. Youth identified both education and employment as their two greatest program needs. An effective education policy for youth is therefore recommended, focusing on education that can lead to employment. Education and training should focus on skills and technical areas relevant to the job opportunities in their communities. The current National Youth Policy is filled with vague concepts and generalisations. For effective implementation, the policy needs to focus solely on a few areas (e.g., education, employment, and immigration) during initial implementation and define these areas more thoroughly through concrete action plans. Currently, agencies, government ministries, and organisations all utilise different age spans to define youth in their policies and programs. For more effective coordination and implementation of the NYP with other youth policies and programs, stakeholders should collectively decide how youths’ age group should be defined. For example, currently the youth age range used by NGOs in their programs often differs from youth as defined in government policy. While certain organisations and policies may still target a subset of the youth age group, establishing a set definition of youth will allow for greater coordination and collaboration among youth stakeholders. Although a National Youth Policy has been created, currently little budget has been allocated for conducting activities related to this policy, and the policy only vaguely addresses this issue. Detailed action plans, rules, regulations, and formal legislation should be designed for effective implementation of the policy. Until these plans have been created, it will be difficult to implement the National Youth Policy. Once activities and programs are established through the action plans, committing a budget amount to each activity or program will be essential. Youth Information Centers are currently lacking resources and funding, and should be equipped with sufficient resources to be made effective. Most Youth Information Centers referenced in the National Youth Policy were discovered to be nonfunctional during the field visit. Furthermore, few youth were aware of them in their districts, and the few Youth Information Centers that were open did not have sufficient resources or funds to be operational and useful to youth in the community. Migration was identified as a huge trend among youth, with lack of employment being one of its greatest drivers. The majority of youth who migrate are male, but females occasionally migrate as well, particularly those traveling with husbands. With open borders between India and Nepal, seasonal migration of Nepalese youth occurs frequently between these two countries. One specific challenge for youth regarding migration is a lack of training and practical counsel on living options for them after they arrive in their destination country. Lack of awareness of these options and alternatives often leads Nepalese youth to become trapped in exploitative work conditions while living in other countries. To address this issue, more advocacy and training on safe migration options for both males and females, as well as a realistic orientation toward life abroad, should be implemented for youth in Nepal. One of the gaps identified through this review was a general lack of information dissemination to youth in communities regarding policies and local programs for youth. Though information is occasionally passed along though various media sources, not all youth have access to these forms of media. For information dissemination, youth have suggested that FM radio would be the most effective way to spread information within a community. Although not all youth have access to televisions or are literate, all youth do have access to some type of FM radio. Youth representation in Village Development Committees (VDCs) is non-existent or minimal in many districts, and youth activities are often the first to get cut out of VDC budgets. The review revealed that youth were only present in VDCs of a few districts; even in those districts, youth did not have a strong voice. More youth should thus be encouraged to actively participate in VDCs in order to have more representation as well as a voice when allocating VDC budget lines for youth activities. Although a consultative process about the National Youth Policy took place in various districts of Nepal, very few Nepali, regardless of age, in the targeted districts were aware of such consultations. Apparently, most of those who were involved in this process had personal connections to the government or to specific organisations working with youth policy. Thus, these consultations may not have been representative of the average youth in the district communities. For future consultations, more effort must be made to ensure more representative samples of youth are involved in the process. We extend our thanks to Khushbu Agrawal, Semanta Dahal, Nabin Rawal, Sanju Koirala, Archita Pant, Srishti Adhikari, Deborah Tsuchida and Harini Amarasuriya for their hard work on the report, to all the persons we were able to interview and discuss the situation of young people and the impact of public policies on youth in Nepal, as well as to the teams of the Open Society Youth Initiative, iDebate Press and Youth Policy Labs.